American National Standards Institute (ANSI) standard C95.1-1982 sets electric and magnetic field strength limits for the general public for frequencies between 300 kHz and 100 GHz. 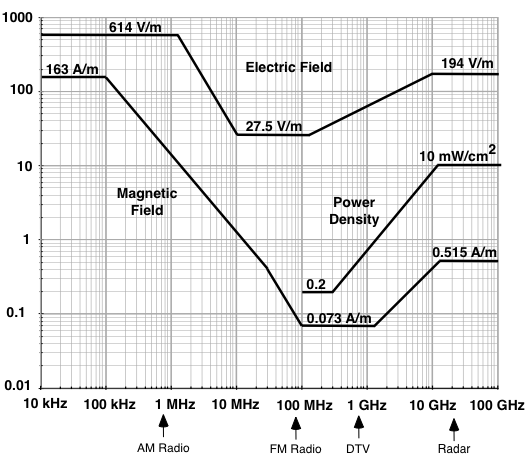 Below 300 MHz the electric and magnetic fields must be accounted for separately. The standard is based on whole body exposure averaged over 6 minutes. At police radar frequencies (X, K, and Ka) the ANSI limit is 5 milliwatts/square centimeter. This equates to an electric field strength of 137 volts/meter and a magnetic field strength of 0.364 amperes/meter. The Institute of Electrical and Electronic Engineers (IEEE) standard C95.1-1991 sets electric and magnetic field strength limits for the general public for frequencies between 3 kHz and 300 GHz. 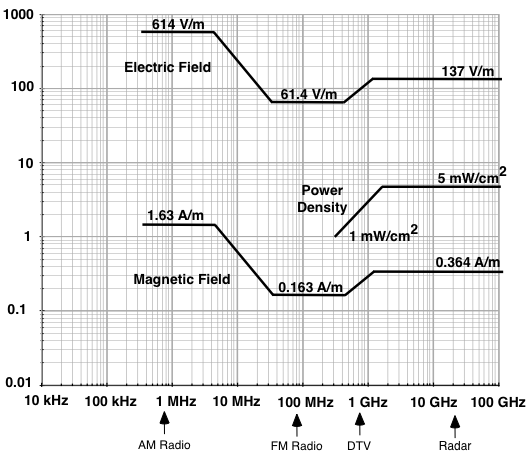 Below 100 MHz the electric and magnetic fields must be accounted for separately. The standard is based on whole body exposure averaged over 6 minutes. At traffic radar frequencies (X, K, and Ka) the IEEE limit is 10 milliwatts/square centimeter. This equates to an electric field strength of 194 volts/meter and a magnetic field strength of 0.515 amperes/meter.